On Friday something happened, maybe something big: For the first time since the Financial Crisis, the yield curve inverted. 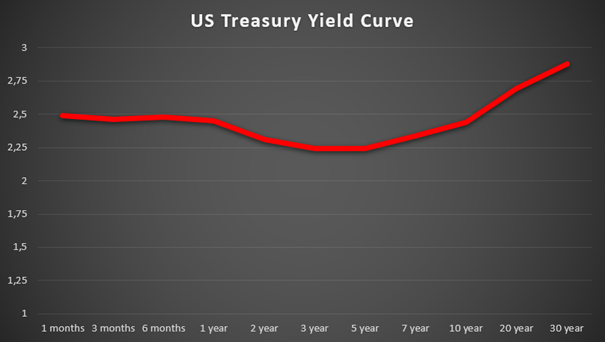 One can argue about the point in time when the yield curve can be described as inverted, but for most experts, the yield curve is inverted when the 10-year treasury yield is lower than the three-month Treasury yield. Last Friday, the 10-year Treasury yield was 2.44% and the three-month Treasury yield was 2.46%. For those who might ask why that is such a big issue, the answer is very simple: Aside from the dark clouds that have already been on the horizon in the last months, we now have one of the clearest warning signs of a recession in the United States. We take this as a cause for another close look at the US stock market, the US economy and some indicators that might give early warning signals. We will start by looking at the interest rates and the behavior of the Fed in the recent past. Information received since the Federal Open Market Committee met in January indicate that the labor market remains strong but that growth of economic activity has slowed from its solid rate in the fourth quarter. As a consequence, the Fed has decided to maintain the federal funds rate at the current level. But aside from that information, the Fed also indicates that it will most likely pass on any rate hikes for 2019 while in December it was still the consensus that at least two rate hikes would follow in 2019. When assuming the federal funds rate will stay stable for the next few months, we have a pattern that has already been witnessed many times in the past (circled in red). We see strong similarities to the last two recessions (the times between 2000 and 2003 as well as 2007 till 2009). In the last century, we also saw similar patterns: in 1960 and 1970. The Fed always raised rates, stopped raising rates and kept the federal funds rates constant for some time and then lowered rates – often dramatically – and the recession began. Of course, this is not a fixed sequence that has to happen every time. We can see examples – especially in the 1970s and 1980s when the Fed continued raising rates even though the recession had already begun. And we can also see patterns – circled in green – when the Fed raised rates and then stopped doing so for some time, and no recession followed within the ensuing few years (we will come back to this in a bit). When we look not only at the federal funds rate, which is part of the yield curve but at the entire “spectrum” of Treasury rates, we see a picture that is getting worse. In the chart below we have included the spread between the 10-year Treasury yield and the three-month Treasury yield (red line) – the one that dipped below zero last Friday. Now we can see that the Fed not only stopped raising rates before a recession but that every time the spread turned negative in the last 50 years, a recession followed. In the short article Recession Signals: The Yield Curve vs. Unemployment Rate Troughs, Kevin Kliesen points out that every recession since 1969 was preceded by a yield-curve inversion. As the yield-curve inversion has occurred on average about 10 months before the recession has begun, we can conclude that the United States will be in a recession at the beginning of 2020. The combination of the Fed interrupting its rate increases and the yield-curve inversion is a pattern that should be a clear warning signal to all investors. A second indicator economists are looking at is the labor market. In its press release, the Fed stated that the labor market is strong, and it is true that the unemployment rate is close to its low point (3.7% in November 2018 vs. 3.8% right now). In his article, Kliesen also mentions the unemployment rate and shows that the unemployment rate trough has always materialized before a recession. On average, the unemployment rate marks its temporary low about nine months before the beginning of a recession. However, the difference in the unemployment rate between the trough month and the beginning of the recession was only 0.37% on average, so the unemployment rate, not a very good early-warning indicator, as it will be really hard to determine the trough within the next few months. When looking at the last four decades, we can see that the unemployment rate has increased when the US economy has already been in a recession. The small increases before are hard to distinguish from the usual fluctuations. In my opinion, it makes more sense to look at the weekly initial unemployment claims, as this indicator is more sensitive to short-term changes and can be used as an alternative early-warning indicator. When looking at the four-week moving average of initial claims, we can see it looks like the trend might be turning, and at least since September 2018, the number has risen than declined. Both the labor market and the bond market can send very clear warning signals for the stock market, and those signals have been very accurate in the past decades. And while the yield-curve inversion is clearly defined and easy to spot, determining the unemployment rate trough is only easy in hindsight. But in my opinion, both are sending clear warning signals right now. These two warning signs are intensified by some other factors I have mentioned several times before, and which we have to keep in mind. First of all, we have to look at the cycle itself and try to determine the current point in the cycle. The current bull market began 10 years ago – in March 2009. Even if we assume that September 2018 marked the temporary highs and the bull market already ended at that juncture, it was (or is) still the longest bull market in history. And while I won’t argue against anybody who is claiming the bull market could last for a few more months or even a few quarters, long investments with a holding period of two or three years are not a good choice right now. We mentioned above that, in the past, sometimes no recession followed when the Fed also stopped raising rates. The big difference between those times, marked in red in the first chart, and 2019, is the point in the cycle. The two-time frames marked in green in the first chart occurred much earlier in the cycle, with still-low valuations, and the bull market had not stretched to its extremes yet. We also should consider the stock market valuations. And while I am aware that the current TTM P/E ratio is only 20.0 (which is still above average), the P/E ratio is not really a good indicator for long-term valuations. As it is fluctuating heavily (a P/E number above 100 in 2009 might be an example) and corporate earnings are usually at their highest at the end of the cycle, there are better indicators for stock-market valuations than the P/E ratio. One option is looking at the 10-year P/E ratio, which signals risk of a crash when the number is extremely high. At the end of February, the 10-year P/E ratio was 29.6, and it was even 33 at the (probable) peak in September 2018. This was the second-highest number since 1870 – only succeeded by the valuation in 2000, but higher than the ratio in 1929 before the Great Depression. A second way to measure valuation is to compare the stock market’s valuation to the current GDP. In Warren Buffett’s opinion, this might be the single best measure to determine where valuations stand at any given moment. 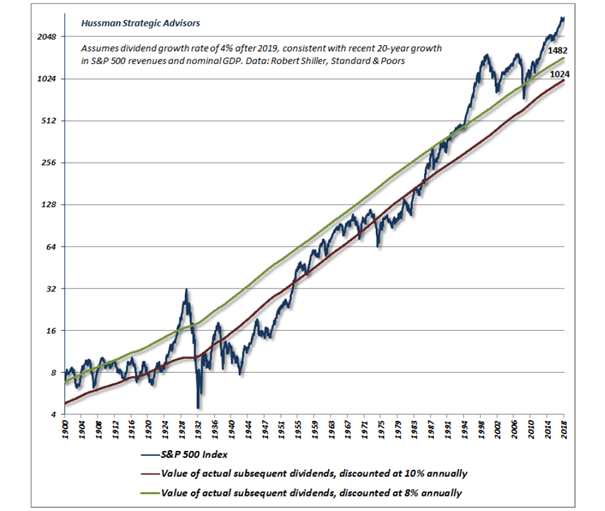 Advisor Perspective only provides data back to 1950, but within those 70 years, the current valuation is once again the second highest, only surpassed by the numbers in 2000 at the peak of the Dotcom Bubble. We also can look at expected future cash flows and calculate the intrinsic value of a stock on that basis. John Hussman calculated the intrinsic value of the S&P 500 (SPY), assuming a 10% discount rate (red line) and an 8% discount rate (green line). The chart below also shows that stock valuations developed in similar fashion to the intrinsic value, but with huge fluctuations. We can also see that the S&P 500 was fairly valued around 2009, but that it has since slowly moved into the territory of extreme overvaluation again. In my opinion, the current market – and especially the US stock market – can only be described as overvalued, but there certainly are many people who believe that stocks are still a good buying opportunity. (Why else would stocks have climbed in 2017 and 2018 or in the last three months?) One of the arguments mentioned rather often is that low interest rates are forcing people into the stock market. And although the federal funds rate isn’t as low as it was three or four years ago, we are still seeing the lowest interest rates for many decades. People tend to argue that current times are different – as they also did in the late 1990s and in the 1920s – and therefore justify the extremely high stock prices. We have to be careful with such narratives – ones that lead to “new era” thinking and are the basis for euphoria and stock-price bubbles. Right now, times are often said to be different because the low interest rates will force people to buy stocks. First of all, it isn’t true that interest rates have never been as low as they are in the recent decade, and in the past low interest rates didn’t lead to infinite climbing stock prices (and as the current cycle is the longest bull market in history, past bull markets didn’t even last as long as this one despite interest rates near zero). Second, financial markets are a complex system, and assuming that just one indicator (interest rates near zero) guarantees climbing stock prices is not only dangerous but also rather idiotic. Financial markets, being a complex system, are influenced by the labor market and the economy (which are again influenced by the Fed and the federal funds rate). Financial markets are also influenced by expectations of participants (which are influenced by economic data or interest rates), and the financial markets have to bow to the fear or greed of market participants, making prices rather irrational from time to time. The chart below shows the P/E 10 and the 10-year Treasury yield since 1960. 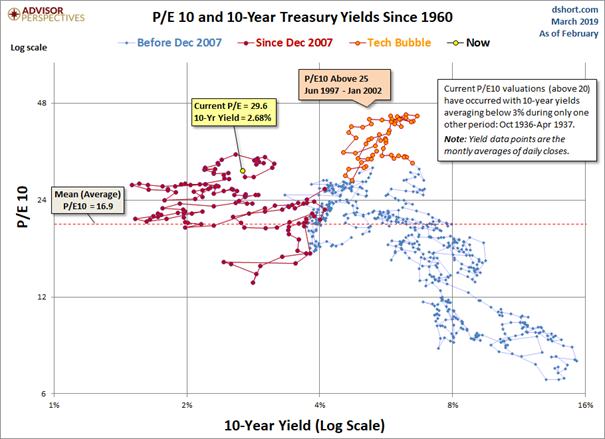 We can see that the P/E 10 has been higher despite higher interest rates (which points to even more irrationality than what we are witnessing right now), but we also see many dots (blue and purple) that are far below the current valuation and Treasury yield. When looking at a shorter time frame, and examining the three months after the last temporary low (from December 24, 2018, till March 24, 2018), we see an interesting development. In these three months, the S&P 500 increased 19.12% (which is an impressive performance over a single quarter). However, the US stock market seems to be one of the few indicators moving into a “bullish direction”. When comparing the stock market performance with the bond market or the labor market, we see some interesting discrepancies. Equity investors seem to be bullish; bond investors, however, are not sharing that enthusiasm. In January the stock market increased and the spread between short-term Treasury yields (i.e., three-month) and long-term Treasury yields (i.e., 10-year) got wider, but since then the US stock market indices have continued to increase while the spread between the two Treasury yields has moved closer and closer to zero. Last Friday, the spread was negative for the first time since the financial crisis. And as most investors or economists would describe the yield curve as inverted, this is clearly a negative sign for the stock market. But it is not only the S&P 500 and the bond market showing strong discrepancies. The weekly initial unemployment claims and the major indices are also moving in two different directions. In the three months between September and December, the four-week average of initial unemployment claims was rising, and the stock market was falling – which makes sense. But in the three months between Christmas 2018 and now, the four-week average number still shows an upward direction – yet the stock market was rallying, nevertheless. This seems counterintuitive. So valuations that are still extremely high, the inverting yield curve and the discrepancies between the stock market and bond market, as well as the stock market and labor market. When combining these pieces of information, it seems likely that we are actually witnessing a bear-market rally: a short-term bullish rally that is merely a correction within a bear market. 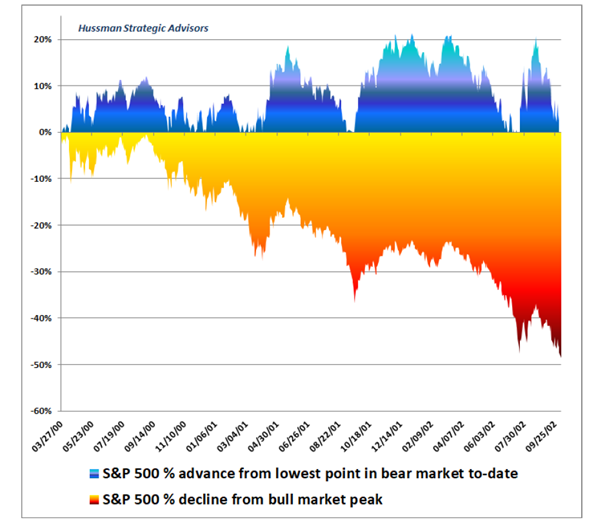 John Hussman shows that such bear-market rallies can last for several months and can seem very impulsive, seeing gains of 20% and more within a short time frame. During the worst crash the stock market has yet lived through – the Great Depression, from 1929 till 1932 – one of those bear-market rallies reached nearly a 50% gain. That by itself is no argument that we are in a bear market. But it is also nonsense to assume that a double-digit gain and a strong bullish moment since December proves we are not in a bear market. We’ve learned in this cycle that the tenacity of speculators can’t be underestimated, so with market internals at the threshold between speculation and risk-aversion, it’s best not to stand too strong in either direction. 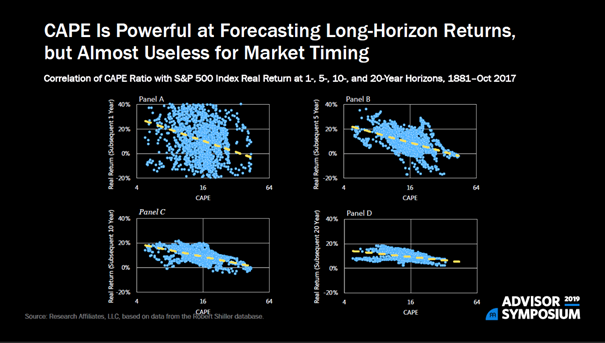 In a recent presentation, “Are Valuations Irrelevant?“, Rob Arnott shows that CAPE can’t be used for market timing, but that it is extremely powerful in forecasting long-horizon returns. The same is true for many other valuation metrics. The high CAPE ratio or the high market-cap-to-GDP ratio is reason enough not to start any long-term investments in the stock market right now. And although it is difficult to time the market, I personally think the market peaked in September 2018 and this bear market rally might have come to an end because of the huge discrepancies between the stock and bond market. A few exceptions excluded, this is not the time to invest in stocks and I will remain on the sidelines. Additional disclosure: I own certificates profiting from a declining Nasdaq-100 and a declining Dow Jones Industrial Average.